SciShow Answers That Most Important Of Questions: Why Does Swiss Cheese Have Holes? But not "why is it so delicious," sadly. Yes, it is the question that has plagued mankind for generations, probably: why does tasty, tasty swiss cheese come filled with holes? The folks over at SciShow know the answer, and want to put you out of your curiosity-based misery. It's a fermentation thing. Who knew? After celebrating their six month anniversary earlier this week, the Curiosity rover has finally consummated its relationship with the planet Mars by drilling its first hole into the rocky surface. Curiosity and Mars have been fooling around for a while now, with the rover analyzing samples and sending photos of the planet's mounds and craters to all its friends, but the two finally went all the way this weekend. 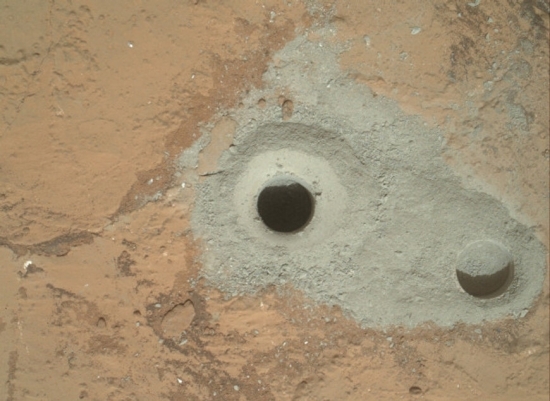 Curiosity's next step is to further probe the hole to search for evidence of a once wet environment.